The help screen requirements are straightforward: This screen must display a large quantity of text and have scrolling capability. Figure 9.1 shows a rough design of the help screen. Rough design for the Been There, Done That! help screen. You want the application screens to share some common features. 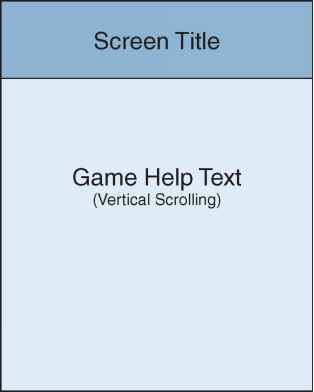 Therefore, you can have the help screen mimic some of the menu screen features such as a header. To translate your rough design into the appropriate layout design, you need to update the /res/layout/help.xml layout file and the QuizHelpActivity class. You want the same sort of title header you used in the menu screen (using a RelativeLayout), followed by a TextView control with scrolling capability. Figure 9.2 shows the layout design for the help screen. Layout design for the Been There, Done That! help screen.